This is the fourth track I’ve recorded in honor of Bassel Khartabil Safadi, a pioneering and beloved Syrian open-source programmer who gave his life to ensuring an open web, teaching others about technology, and contributing his experience freely to help the world. Syrian military police arrested him in 2012 for unstated crimes, and held him without trial. In August of 2017, the world learned he had been executed in October 2015. To this date, his body has not been given to his family for proper mourning and burial, and the manner in which he was put to death remains a mystery. In the end, pessimism breaks people quicker, and with more permanence, than fear. The greatest weapon used against free-thought warriors such as Bassel is not to make them scared – it’s to make them feel alone in their fight, discouraged and ashamed. All sounds either Bassel or guitar. Underlying bed is reversed “Amazing Grace” mixed with three tracks of Bassel’s phrase ~13x stretched: One track is him harmonized and pitched down to F#; One is him disambiguated as noise; One is him just straight up sloooowed doowwwn. Floated over the affair with an eBow. This track marks my 69th Disquiet Junto contribution. My studio suffered an irreparable crash last week while attempting the first of these two most recent #freebassel projects. Kind creative forces graced me, however, with a few workarounds and a long-overdue seat kick into a more current-era workflow. I hold onto the thought that all my tech disruption (forced unwinding and time-zero reconfiguration of twenty+ years of habits) would make Bassel, well, just laugh. I hope that laughing’s all he’s doing now. This week’s track, though, was the first of these for Bassel I recorded knowing he will never hear it. Killed the urgency and upped the poignancy, I guess. Wish I was less numb about all this. Pay tribute to the late Bassel Khartabil by turning his spoken words into music. 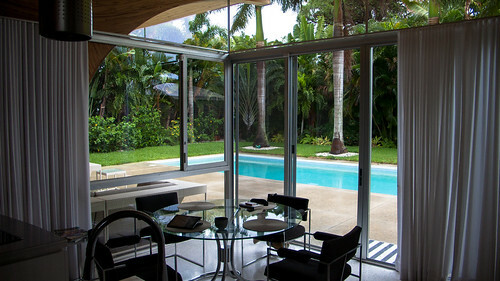 Spending this week in Venice, FL, at The Herron House. Built by architect Victor A. Lundy (FAIA) in 1957 for the Herron family, the house was restored to its original grandeur by its current owners, Ursula Kohl and Peter Bartos, in 2008. It’s a masterstroke of mid-century American imagination, and a timeless time capsule that will always feel like the future. Most of the house is open-plan (only the bedrooms and offices have doors), all the rooms, save one, have at least two glass walls, and there are two spectacular rooms within the envelope of the roof line that have floor-to-ceiling screens as their 4th walls separating them from the outside. The result is a house that breathes with its occupants (lizards included), creating an inside-out and outside-in soundscape that leaves you in a true suspension of time and space. This piece was recorded inside the house during night and day rainstorms (Rooms A and C, respectively), as well as a clear morning (Room B). Most of the time, the house provides a serene silence, which I wanted to capture for the C-section, but the iPad mic is not conducive to recording nuanced calmness, so this piece captures none of the house’s tranquility. Rest assured, however, this has been a relaxing week, replete with luck to have graced its environs. Went minimal to the max for this. Only mics I have down here are an iPad and iPhone, and only DAW is a GarageBand program I never learned to use with any proficiency. The project instructions said “don’t add any other effects or sonic material,” so here’s three rooms, with zero(0) processing, in loose arrangement as a song. Each room’s stereo tracks are two tracks recorded close in time, panned left and right. I’d call it unfinished, but I’m on vacation, slipped into another life, so I lost where I started. GarageBand audio recorder –> iCloud –> GarageBand 10.2.0 for OS X Sierra. 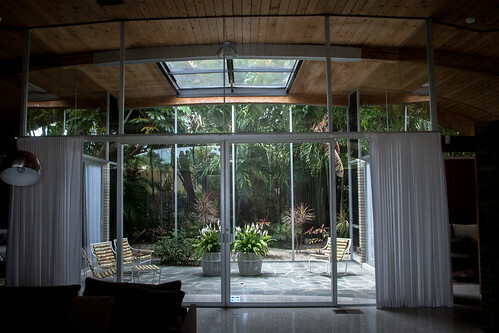 Rear sun room. This room is one of the two rooms with a screen-wall, and also has a massive screen skylight that allows rain inside. The tick-tocking sound (a short sample of which is looped as the Room A tone) is rain hitting the metal arm and vinyl-covered padding of a vintage outdoor rocking chair sitting under the screen skylight. Front sun room, secondary entertainment and dining area. 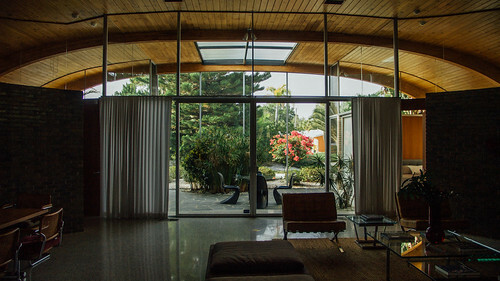 Like Room A, this room also has a floor-to-ceiling screen wall, which in this room’s case faces the driveway and gives vegetation obscured views of the street. This room has an opaque glass skylight, however, so remains protected during bad weather (aside from whatever might pass through the screen wall in windier conditions). The recording was taken on a calm morning while drinking coffee at the table in the room, and the local birds were out in full force in the palm trees and plants that shield the house. Kitchen informal dining area. Floor-to-celing glass-enclosed on 3 sides. Looks out on the pool and outdoor seating area. The downspouts from the roof are tucked away on either side of the exterior of this room. As a result, during rainstorms, sitting at the table results in a stereo clattering of water rushing down from the roof to the underground drain. The glass is true to 1957 vintage and single paned, so there isn’t much in the way of sound absorption. The effect lends the sensation of standing behind a waterfall in a dry cave. Check out my Flickr for some detailed interior and exterior shots of the house. There’s also on a Junto Slack. Send your email address to http://twitter.com/disquiet for Slack inclusion. ths wk's @disquiet junto led down a road to a new fav aural sculptural concept: "the cone of confusion"
The records you make don’t freeze so much as liquify time. As with Michel, 1983 was a pivotal musical year for me, too, so this week’s challenge fired a wonderful cascade of memories. Playing with the tonal and harmonics filters in Paulstretch, I stretched each of the three 32-year old samples to 32x their original length (and M1 also to 64x)a few times. Brought them into Sony Acid and started layering at random. Touches of reverb, compression, chorus and resonance found a sweet spot of lushness – where I was at ease with bygone days. The piece runs at 137.1 BPM (which is what M1 beatmapped to), so a sync’ed 8th note amplitude modulation was added to the M2 sample to create a ping-pong glitch beat at that tempo. This was the third Disquiet Junto project that revolved around Bassel Khartabil Safadi, a coder, artist and free-expression pioneer wrongfully jailed by Syria, his home country, for “harming state security.” In October, he was transferred to a secret location, and his whereabouts as of this writing are unknown. This past week (2015.11.14), disturbing rumors surfaced of a possible death sentence. The background and all current updates on Bassel’s case can be found here: http://freebassel.org. Please sign this petition and hold the Syrian government accountable for Bassel’s fate. Twenty seven artists contributed to this Junto project, which endeavored to create an audiobook of the Creative Commons collection of essays about Bassel, The Cost Of Freedom. I chose hellekin’s epilogue, The Cost Of Future Tense, a beautiful piece of writing that became more transcendent with each successive reading. I didn’t want to get in the way, so went about crafting a minimal, improvised ambient duet for acoustic guitar and AniMoog to allow the words to float and breathe. I was proud to contribute a track to the first #freebassel Junto project in 2014, which coincided with the 2nd anniversary of Bassel’s incarceration. That track, Intransitive Disappearance, was also released on my record, Particle Theory (bandcamp | soundcloud | freemusicacrchive). The source of the text in this project is from the book The Cost of Freedom, which raises awareness about the ongoing detainment of Creative Commons coder/artist Bassel Khartabil Sadafi. In which I fire up my old-friend Casio CZ-1000, program a quasi new wave dance groove with Acid loops and sight read the notes in the photo. The CZ was set to a square wave with a slight detune and vibrato. Luckily, it goes 6-note polyphonic so it handled the 3-note chords fine. 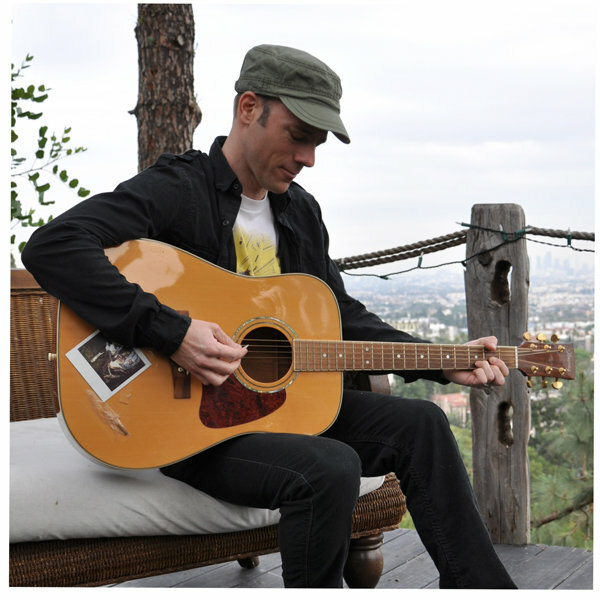 The 11-measure sequence in the photo is repeated as 8 measure sequences break it up into a couple verses, choruses and a bridge. The 11 vs 8 tension resulted in no two verses or choruses having the same melody line, which served to amplify the fun. Very meditative, too, to allow whole notes to fill spaces. I had designs on recording the bass on the Casio, too, using the image’s staff as a bass clef. This created more mess than movement, though, so I left the photo to represent a treble clef staff only and built the piece around a right hand melody. Sight-read the whiteboard notation from a children’s music class. Step 1: Read the music notation in the following image (note that the photograph was taken at a music class for elementary and preschool students). Step 2: Record a piece of music based on that notation. Deadline: This assignment was made in the early evening, California time, on Thursday, October 1, 2015, with a deadline of 11:59pm wherever you are on Monday, October 5, 2015. Length: The length of your finished work should be roughly one minute, though longer is certainly fine.